Feeling the gentle light of the early morning dawn, I lie still in that half way place between dream and wake as I vaguely remember dreaming all night that someone must have a pet monkey in the next room. Then as I slowly gain consciousness, I hear clicking noises out the window and realize the obvious fact that the incessant chatter that was disturbing my sleep was not the pet monkey of some guest, but rather the sounds of a real animal right outside of our room. I am struck by the fantastic reality that I am waking for the first time in Africa. I step out on to the veranda and to see the sun breaking over the river Cheri as it snakes its way in front of the hotel. I can see the fisherman poling across the lazy river collecting the morning catch and on the far bank in Cameroon farmers are already busy working their plots. I walk down to the grounds and up to the barded wire fence that separates the hotel from the muddy banks of the river below. 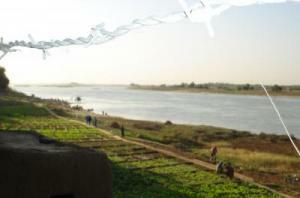 There are families living in huts and plots of crops growing along the river banks below. There is a family below and woman holds up two, 3 foot long catfish, and asks me in Arabic if I would like to buy them? I try and explain that I am mostly a vegetarian and everyone laughs in that uncomfortable way that happens when you don’t share common language and neither side can understand what the other is saying. As I politely decline her offer, I am struck by the reality of how strange it is to explain the luxury of my picky eating habits to people who know what real hunger is. I’m not sure how much lactose intolerance or vegetarianism exists here, but my guess is that people are probably just grateful when they have something eat. I ‘m not sure who posted : Sunrise on the river Cheri,but the monkey in the room nextdoor,made me laugh so much!! Uuuuuuups ,I just noticed .the monkey dream is Joshua’s. Ay connie, son los chicos del agua. Hi KTJ, thanks for bringing us in your journey with your writing. Don’t mind Connie she has some weird thing about Monkey’s ;0) I should know she only asked me a thousand times to imitate them when I was young. Stay Veggie, but yes as you say people in these situations do not have the luxury of eating the way we are use to. Keep us posted and let us know of if you have more dreams. JC,I am soooo cofuuuuuuuuuused???????????? KTJ Had the monkey dream?????????????Connie???????????????? the last posting about the “monkey” was by Joshua and and yes, KTJ is Veggie but so is Joshua and JC I think you confused the last posting to be KTJ’s but it was written by Joshua after his first night in Chad. Connie son los chicos que “venden” agua que tambien estuvieron en Camp DARFUR en el concierto de Topanga Canyon. I know what you are doing out there is really putting your life on the line and there is always fear of the unknowns. Just a little note to let you know we are praying for your safe return and for the resolution of this conflict. What you are doing is a real eye opener for us. Thank you for your sacrifice and dedication. I am so happy that you have invited my sister, Tiffany, to your team. Thank you for all your work!! !